We are one of the leading service providers of Pallet Racking Solutions. The offered services are widely used to store materials on pallets in horizontal rows with multiple levels different material handling applications. By using latest tool and equipment, these services are timely executed by our team of professionals. How does pallet flow storage system work? •: Picking of load is excellent with all individual loads accessible. •: Stability & Safety is very good. •: Utilise about 30 - 50% of floor space. •: All types of conventional fork lift trucks can be used. 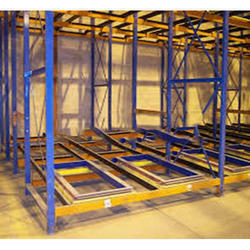 We are known in the market for our best Selective Pallet Racking System in various sizes. We offer these services to various industrial sectors and apply sturdy iron metals to manufacture them. These racks are high in demand and are installed in various leading industries all across the nation. These are strong, best in price and are provided in numerous specifications. Features: Guide rails to guide MHE., Galvanized or Powder Coated finish options. With our rich industry experience in this domain we are able to manufacture and supply our clients a vast assortment of Pallet Rack System. Our world class manufacturing facilities provides us the privilege to produce pallet racking. These racking systems are available in different heights and size variants. Also these have an increased capacity and they consume less space. 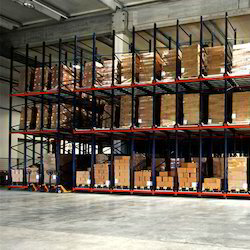 "Fit-O-Fit" Pallet Racking System is designed to meet your requirement for a modern, economic and rational warehouse. Our System will ensure the optimum solution to your storage problems of bulky & lengthy stores, Drums, timbers etc. Godrej Selective Pallet Racking is the simplest & economical racking system which allows 100% accessibility to each pallet. This racking is suitable for large variety of SKU's irrespective of quantity.